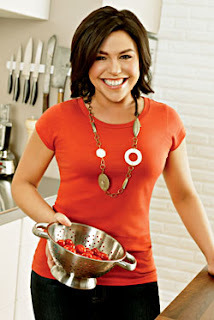 Every time Rachael Ray comes out with a new product, I have to giggle because I know it really pisses off her critics. When she came out with a line of dog food, called Nutrish, I thought they were going to go over the edge. But now she's moved into another arena - home cleaning products. According to the Staten Island Advance, this week the Fancy Food Show is going on in Manhattan and one of the trends is "going green." As part of that trend, Rachael Ray has teamed up with olive oil maker Colavita to create a line of household detergents with a "cleaning green" label. "It's a little bit of a departure for us, but the timing is right," said Profaci, noting the line of sink soap, hand soap, countertop cleaner and other items. "Rachael Ray is a great spokesperson for us. She is a great protector of the environment," he continued. "Coming from a small town in upstate New York she always had a feel for nature." Rachael is also endorsing a whole wheat pasta made by Colavita. That endorsement certainly makes sense since Rachael has starting using whole wheat pasta a whole lot more and recommends it in many recipes for kids. So, will you buy "green" cleaning products from Rachael Ray? Photo from Every Day with Rachael Ray. Yes I would buy them on 2 conditions, one that they end up in Australia! and two, if they were cost effective. Would you buy them? Have you bought her other things? I'd probably buy RR cleaning products, especially if they were "green." Right now I use these Mrs. Meyer's "earth friendly" products when I clean.